Follow @mcphoo Tweet I've been wearing Vibram FiveFingers (VFF's) for about a year now. Yup, a year. While the challenge of what to do out doors when either sub zero or wet wintery are still a mystery, wearing these shoes for this length of time has let me observe/experience an intriguing phenomena about which i've seen little (ok no) comment: feet changing size. I'll say right now that i measure my feet by my second toe - happens to be the longest (tips on fitting VFF's here). Thus i have room in my VFF's in the big toe pocket. So much so that wearing the same size VFF's with or without socks was no problem. Initially. Something happened in mid may after wearing VFF's indoors from nov - march, and then just all the time from march - may. My vff's with sox started to feel small. On the right foot only and mainly pulling on the big toe. Where i'd had room. I didn't know how to make sense of this. At a z-heath s-phase cert talking with DC Eric Cobb, i asked if one's foot size could change in shifting shoe types. Oh yes, he laughed. Great. Fortunately summer weather was coming and the sox could be dispensed with and the shoes were ok again. Now it's getting cold, sox are coming back on and funny thing, the vff's (mainly the kso's) do not seem to be as tight now. Have they stretched out? I asked z-health master trainer Zachariah Salazar at another recent z-health ho down - and a guy who's almost as footwear fanatical as i am - and he said that he's watched his feet change in both directions: as his shoes got flatter and more open, the feet got longer/bigger. But now, he says, as his muscles seem to be readapting in the feet again, they're pulling back in as his shoe size has come back down again. Perhaps that's what's happening with my feet - a re, re-adjustment. Dunno. But it's interesting. I recently got to try on a pair one size up in the kso with socks. i'm sure this is what the current size *used* to feel like. time to think upping the size for winter wear - but they don't even feel that big without the sox. yup there's been a change in me, as the song goes. Any other VFF wearers out there had any similar experiences? Please post your foot size changing experiences. Did not think too much about it but I am coming up for nearly a year wearing sprints when running (300+ miles) and recently thought that perhaps they had stretched out as toe pockets seem to be longer. Never really thought it might be my feet changing. If you are wearing a minimal shoe that is not messing up the adaptation process, the feet are now "free" to adapt primarily to the stimulus from training, day to day activities, etc. Change your training or activities of daily living and your feet will change too. The key question then is, "What do you want your feet to adapt to? Thanks Jason and Mike for dropping by. Michael, how do you answer that question? what do you want your feet, personally, to adapt to? You still have to move well. I like Frankie's quote too "Wearing the same shoes all the times = shoe shaped feet" Having different types of shoes is a good idea (again, as long as you move well in them). When I first got my KSOs back in mid-August, I was afraid they were too big. I came close to sending the 39 back in to exchange for a 38 but decided to wait and give it time. A couple of weeks later, I felt like the 39s were a good fit and was glad I stuck with them. I've worn nothing but bare feet or my KSOs until now (mid-December) and am planning to get a pair of Flows in early January for walking in the snow and slush. Thing is, I'm going to order a 40 because my feet have gotten bigger. Now, I can't walk more than a couple of miles in my KSOs before I get a pain on the top of my feet, over the front of the arch and the ball, on the outside half of each foot. My big toes feel pinched at the corners of my toenails and -- get this -- my second toe (which is not longer than my big toe) is starting to bend! They're both starting to arch toward the little toe! What's scarier is that I can't wear my old shoes anymore at all. I put them on and felt like I had boxes on my feet. (And these were super-comfy birkenstock Mary Janes.) I can walk about 1/3 of a mile in them before I am limping and can only barely make it the 1/3 mile back home, in great pain. So I'm stuck with wearing the KSO 39s for another couple of weeks and when I get my 40 Flows, I'm also going to get 40 KSOs so I'm ready for summer. I was goign to give away my 39 KSOs but after what you said about your feet getting smaller again, I think I'll hold on to them, in case my feet shift size again! Thanks for posting about this issue. I came online to search because I thought I was going crazy and your post was the first link Google gave me and is VERY reassuring as to the state of my sanity. At least as concerns my VFFs. Could the change possibly have anything to do with the weather? Don't feet tend to swell a bit on hot days? I'm still waiting for my first pair of VFFs in the mail, so I'm yet to experience any of these changes myself. Just a thought. and less of just a lengthening. So anyone who's been wearing vff's through a season will likely have gone through the regular daily or seasonal foot swelling. This particular foot change, as others have testified, seems to be of a different order. If i could find a way to get taller by the same process, i would. hi there...did it means wearing these shoes will causing foot size changing smaller? I can't comment (yet) on VFFs causing the size of one's feet to change, but I experienced the same phenomenon when I first moved to the U.S. and couldn't work for 3 years. I stayed home and, consequently, pottered around the house either barefoot or in socks for the majority of the time. One day, after a couple of years of this, I realized that nearly all my shoes felt small and tight. I actually had to go out and buy a couple of pairs of shoes a size larger than usual. Since I've been back in the land of the (shoe-wearing) working population - some 10 years, now - my feet are back to how they were. I've been wearing five fingers exclusively for the last year or so. Before I started wearing them, I had extremely flat feet, and wore size 13. Since I began wearing them, though, my feet have decidedly shrunk a size and a half, and I've gained an arch. I toned back on barefooting for a bit, and started doing long runs slowly. I recently (2 weeks ago) did a 28 mile run in VFFs with no pain at all, and now I train barefoot or VFFs full time. My VFFs are starting to feel small again, and I've already gotten myself a size 43 for when the tears in my KSOs become problematic. I've only worn Vibrams for the last year. I started with flows last winter and moved onto several pairs of KSOs. Last year my flows were plenty loose enough, but this year they are too tight in the toes and too short as well. I'm glad to see my feet changing- that's the reason I started wearing Vibrams in the first place. 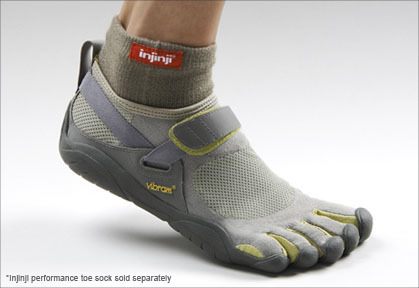 However, I'm not looking forward to buying all new Vibrams this year. wearing them for a year as well. I have three pair at the moment. jaya, bikila and KSO's. and although the length of my feet hasn't increased, i'm still in a 40. the width has to the point of being completely incapable of getting my feet in regular 40's or 41s. i'm heated! Why Not "Train Through Pain"?